﻿ Fun Easy English - Travel the United States of America - Oregon. Learn before you travel. This section of Fun Easy English focuses on facts and other cool stuff about your favorite U.S. state. This is great English reading practice. 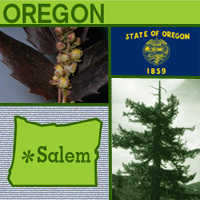 This page focuses on the state of Oregon. The Oregon state flag was adopted in 1925 and is the only U.S. state flag that displays different images on front and back. The Oregon flag has gold lettering and symbols on a field of navy blue (Oregon's state colors). The flag's face displays part of the state seal and the words "STATE OF OREGON" and "1859" (the year Oregon was admitted to the Union). The parade flag (or "dress flag") has a gold fringe, but the utility flag has a plain border. The symbols on the shield include the mountains and forests of Oregon, an elk with branching antlers, a covered wagon and ox team, the Pacific Ocean with a setting sun, a departing British man-of-war ship (a symbol of the departure of British influence in the region) and an arriving American merchant ship (a symbol of the rise of American power). The 33 stars supporting the shield signify that Oregon was the 33rd state to join the Union. The reverse of the flag pictures Oregon's official state animal - the beaver (Oregon's nickname is The Beaver State, stemming from the early 19th century when fur hats were fashionable and Oregon’s streams were an important source of beaver). Origin of Name May have been derived from that of the Wisconsin River shown on a 1715 French map as "Ouaricon-sint." Travel and tourism site for Oregon - This state travel and territorial tourism site provides ideas for your vacations, meetings, and more. You may have built a sand castle or two, but have you ever built a sand castle as elaborate as the one in this photo? Every year in the small coastal town of Cannon Beach, Oregon, all sorts of things are made out of sand in the Cannon Beach Sand Castle Contest: cars, pigs, fish, almost anything you can think of! Most of the people who enter this contest enjoy building things out of sand just for fun. Some people, though, are professional sand sculptors and make a living building things out of sand. They might create a sand sculpture at a shopping mall, for instance, to promote the mall and get more people to visit. The sand castle contest began in August 1965 as a result of a natural disaster. A year earlier Cannon Beach was hit by a tsunami (an enormous wave). The tsunami (pronounced "soo-nah-mee") did a lot of damage to the town, but it also brought a lot of attention to the area because afterward the lowest tides of the century took place. Two people decided to hold the sand castle contest to take advantage of all the media attention. Today, the contest begins just after the morning high tide and ends about 12 hours later as the next high tide reclaims the beach -- and all the beautiful sculptures. Kids of all ages are welcome to participate. What would your sand castle look like? Did you know there was a volcano in Oregon? And that when it erupted and collapsed it created a lake? Around 7,000 years ago, the volcano Mount Mazama erupted and collapsed and, as a result, formed Crater Lake. Molten lava cooled and sealed up the bottom, forming a huge bowl-shaped crater. Over the years, rainfall and melting snow have filled it with over four trillion gallons of water, making it the deepest lake in the United States. The lake is also known for its deep blue color. Accounts of the eruption of Mount Mazama are found in stories handed down by the Klamath Indians, who are descendants of the ancient Makalak people. According to Makalak legend, there was a battle between Skell, the spirit of the sky, and Llao, the spirit of the mountain. When Skell defeated Llao, the spirit of the mountain's home, Mount Mazama, erupted and collapsed. Crater Lake is now a national park and draws approximately 500,000 visitors a year. For Americans, Thanksgiving Day is a holiday when we give thanks for all our blessings, including food. In Ghana, Africa, people also have their own type of Thanksgiving, called Homowo. Long ago, when the Ga people were traveling across Africa to reach the continent's western coast, they experienced many hardships, including great hunger. They traveled for many years, but they helped each other through difficult times and survived to settle in what is now known as the country of Ghana. After they settled and their harvests were plentiful, they had all the food they needed. They held a harvest festival, called Homowo, that mocked the hunger that they had suffered during their journey. The word homowo can mean "hooting or jeering at hunger" in the Ghanian language. The Homowo festival in Portland, Oregon, is a harvest holiday of welcoming and thanksgiving, like the one celebrated by the Ga people of Ghana. The festival began in 1989 as a way for people to share the traditions of Africa and pass them on to new generations. There is a lot of joyful dancing and singing and, of course, lots of food! In Pacific City, Oregon, people love to go to Cape Kiwanda to watch the dories. Have you ever seen a dory? A dory is a flat-bottomed boat, pointed at both the bow (front) and stern (back) so that it can easily ride the waves. Fishermen first used dories in New England in the early 1800s. Eventually, fishermen along the Oregon coast began to use dories, too. Traditionally, dories were powered by fishermen, who rowed the boat with long oars. Large fishing ships used to stack dories several boats high on their decks and when they arrived at a fishing spot, they would send two to four men out in each dory to catch fish. Today, many dories have gasoline-powered motors for speed. Each year in July dory fishermen from the Pacific City area bring out their dories for a festival called Dory Days. People eat fried fish and watch the dories, old and new, as they race on Cape Kiwanda. Do you know what a rhododendron looks like? It is a big bush-like plant with large and numerous flowers in shades of pink, red, purple and white. Rhododendron is the common name for a flowering plant of the heath family, which has more than 850 species. They are native to the Himalayas, southeastern Asia, the mountains of Malaysia and the coast of the Northern Hemisphere. In Florence, Oregon, the beautiful white-pink plant begins to bloom in May, and by June the surrounding area is covered with its warm, radiant colors. The Florence Rhododendron Festival celebrates the arrival of spring. The pioneers believed that the bloom of the rhododendrons meant that summer was around the corner and the cold and rain of winter would soon end. The festival was first held in 1908. Because modes of transportation have changed since then, the festival has changed too. To get to the festival back then many people took stagecoaches pulled by horses; a few years later, they arrived by train on the new railroad. By the 1940s automobiles were common, and that's how most people got to Florence. By 1960, automobiles were so popular that the festival began to feature a show for fancy sports cars. Another popular event was the motorcycle races. For the past 20 years, "bikers" (the casual name for motorcycle riders) have come to Florence from all over the West Coast to watch the races and see old friends. And, of course, they come to enjoy the beautiful rhododendrons. Why are those three covered wagons surrounded by a fence? If you look closer you'll see that they aren't the kind of covered wagons you can ride in. They are being used as a canopy for the End of the Oregon Trail Interpretive Center, a museum devoted to the history of the Oregon Trail. The Oregon Trail was a route used by people who traveled to Oregon Country, which is what Oregon was called before it became a state in 1859. The Oregon Trail was the most popular way to get to Oregon Country from about 1843 through the 1870s. The trail started in Missouri and covered 2,000 miles before ending in Oregon City. Most people moving west traveled in covered wagons, which were large enough for all their belongings as well as the food they needed for a journey that could take months. The wagons also provided shelter from the weather. Teams of oxen or mules pulled the wagons along the dusty trail. People didn't ride in the wagons often, because they didn't want to wear out their animals. Instead they walked alongside them, getting just as dusty as the animals. The long journey was hard on both people and animals. It was even hard on the wagons, which usually had to be repaired several times during the trip. To help remember the hardships these pioneers faced, Oregon City constructed this museum so others could learn about the lives and experiences of these pioneers. The following is a description of national forests, parks, and monuments in the state of Oregon. If you plan to visit or live in Oregon for awhile then you should definitely plan to visit some of these fantastic places. On the east side of the Cascade Range, Deschutes National Forest includes Newberry National Volcanic Monument and five wilderness areas. 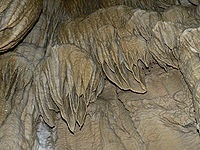 Lava River Cave, at 5,211 ft (1,588 m) long, is Oregon's longest lava tube. In the Blue Mountains of eastern Oregon, Malheur National Forest's highest point is Strawberry Mountain at 9,038 ft (2,755 m). The Cedar Grove Botanical Area contains the only stand of Alaska yellow cedar east of the Cascade Range in the United States. This forest is named for and contains Mount Hood, the highest point in Oregon at 11,249 ft (3,429 m). The forest stretches from the Columbia River Gorge and includes Mount Hood National Recreation Area and nine wilderness areas. This forest ranges from the Cascade Range to the Siskiyou Mountains, and the Rogue River drains over 75% of the forest's area. There are parts of eight wilderness areas in the forest as well as what may be the world's tallest pine tree, a ponderosa pine that is 268.35 ft (81.79 m) tall. This national forest is also partially located in the state of California. Located in the Blue Mountains of northeastern Oregon, Umatilla National Forest includes three wilderness areas, occupying over 20% of the forest. The forest has over 715 mi (1,151 km) of trails, 2,000 mi (3,200 km) of roads, and one of the largest elk herds of any National Forest. This national forest is also partially located in the state of Washington. 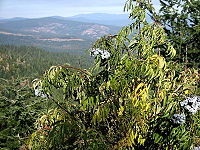 Umpqua National Forest is in the Cascade Range of southwestern Oregon and includes three wilderness areas. Watson Falls is a waterfall that is 272 ft (83 m) high on Watson Creek, a tributary of the Clearwater River. Wallowa-Whitman National Forest stretches from the Blue Mountains to the Snake River. Elevations range from 875 ft (267 m) in Hells Canyon, the deepest gorge in North America, to 9,845 ft (3,001 m) at the summit of Sacajawea Peak in the Eagle Cap Wilderness Area. 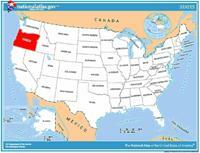 This national forest is also partially located in the state of Idaho. Crater Lake lies in the caldera of an ancient volcano called Mount Mazama that collapsed 7,700 years ago. The lake is the deepest in the United States and is noted for its vivid blue color and water clarity. Wizard Island and the Phantom Ship are more recent volcanic formations within the caldera. As the lake has no inlets or outlets, the lake is replenished only by precipitation. Located within the John Day River Basin, the Fossil Beds have a well-preserved, complete record of fossil plants and animals from more than 40 of the 65 million years of the Cenozoic Era. 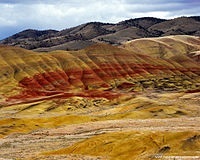 The monument is divided into three units: Painted Hills, named for its delicately colored stratifications; Sheep Rock; and Clarno. Blue Basin is a volcanic ash bowl transformed into claystone by eons of erosion, colored pastel blue by minerals. Located within Deschutes National Forest, the monument protects the area around the Newberry Volcano and its geologic features. It contains over 50,000 acres (200 km2) of lakes, lava flows, and other geologic features. The monument is known for its marble caves, as well as for the Pleistocene jaguar and grizzly bear fossils found in the deeper caves. There are four primary buildings: The Oregon Caves Chateau, The Ranger Residence, The Chalet, and the old Dormitory.